Our top pick of Abu Dhabi dining deals taking place this month. The finest Mediterranean fusion cuisine is served at Blue Marlin Ibiza UAE. Fresh seafood, tapas, sushi and tender meats are all on the menu, alongside vegan options and light bites. 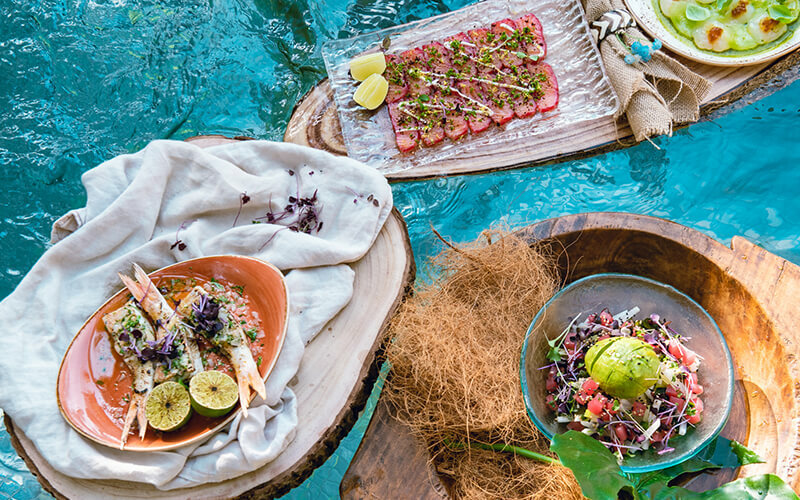 With a focus on sharing, Chef Mahmoud Turkmani has created a delightful a la carte menu that is the perfect fit in the unique beach setting. For a laid-back atmosphere with delicious flavors, BMIUAE offers the ultimate beach club dining experience, perfect for enjoying during the UAE’s great weather months. Call 056 113 3400. For the first time in the UAE, celebrity chef Dharshan Munidasa visits Abu Dhabi for a three-day Ministry of Crab pop-up event hosted at Shangri-La Hotel, Qaryat Al Beri from 25 to 27 April 2019. The event features four signature dishes from the famed Sri Lankan restaurant, which has been named as one of the top 50 in Asia. Chef Dharshan is best known for his focus on high-quality, fresh ingredients that he often pairs with Japanese cooking philosophies. The menu kicks off with a sharing plate of a creamy Crab Liver Pâté, followed by the rich Baked Crab, likened by many to a Crab Risotto. A winning dish is Garlic Chilli Prawn that Chef Dharshan cooks in Italian olive oil, Japanese soy sauce, garlic and chilli flakes in a style that is unique to Ministry of Crab. Ideal for two to share, the much-loved Pepper Crab celebrates two ingredients endemic to Sri Lanka, where the freshness of the crab is fused with the heat of hand-crushed peppercorns, whole peppercorns and pepper stock. Call 02 509 8888 or email reservations.slad@shangri-la.com. Lebanese restaurant Sambusek has introduced a new one-of-a-kind dining concept – At Home with Chef Emad. The experience offers connoisseurs of the cuisine the chance to enjoy a traditional meal served by the chef himself right at your table with views overlooking the Arabian Gulf. Sambusek Head Chef Emad Zalloum is a popular ambassador of the eastern Mediterranean cuisine and describes the new concept as “a personable culinary journey with a homey feel”. The “At Home with Chef Emad” culinary treat starts with a variety of cold mezze including Sambusek’s signature smoked hummus, mutabbal, labneh hammda, fattoush, tabbouleh and a mixed organic platter. This is followed by an assortment of hot mezze, which includes chicken liver, makanek, cheese manakish, and prawns Provencal. These will be served with Lebanese bread freshly baked in a wooden oven. For the main course, guests have two options: charcoal mixed grill and ‘Noah’s Ark’. The mixed grills consist of a wide selection of lamb chops, lamb shish kebab, lamb kofta, chicken shish taouk, and grilled vegetables. To satisfy the sweet-toothed, Chef Emad serves the Sambusek Sunset, which allows one to have a taste of all the signature desserts at the award-winning restaurant including Aish el Saraya, Arabic ice-cream, and cheese kunafa with Emirati honey. Available every Thursday evening for a minimum of four guests per table, the experience is priced at Dhs235 per person, inclusive of beverages. Call 02 813 5550. Brunch fans are set to be transported to the vibrant streets of India with the launch of Mundo’s Desi Brunch, a new concept that will showcase the diverse cuisines of India via live cooking stations alongside traditional beverages, henna stations, live entertainment, including a magician, and more, every Friday from 1pm to 4pm. To start, the live cooking stations of chaat, kathi rolls and tawa as well as tandoori in a clay pot, are designed to take brunch-goers on a journey through the bustling street stalls of India. Following this, main course takes a Thali-style approach to dining with the likes of fish tamarind masala, prawn bhuna, mutton rogan josh, murgh tikka masala, dum biryani, and much-loved butter chicken refilled directly at the table. All this plus much more. Desi Brunch starts from Dhs125 per person. Call 04 432 3232. For a fun-filled foodie afternoon in Abu Dhabi, check out St Regis Abu Dhabi’s Friday brunch here.